According to the archaeological evidence, the Aztec language originated in the southwestern region of the United States. The Mexica people who spoke this language migrated from this region to Central Mexico where, with the passage of time, the language became dominant. However, there are dissenting opinions from scholars according to whom the language actually originated in Central Mexico. The speakers of the language are thought to have migrated into the Mesoamerican region around 500AD. By the time the Spaniards arrived in America, the Nahuatl language was the most widely spoken language in the region and the language of the Aztec Empire. Before the advent of the Spanish conquistadors, the Aztec language did not have its own alphabet. Instead, it was written with a pictographic script. This pictographic script was not a fully developed writing system but served as a sort of mnemonic reminding readers of the text they had learnt orally. This pictographic script appeared in various stone carvings as well as picture books. During the wars with the Spanish conquistadors, most of these picture books and carvings were destroyed. It was the Spaniards who introduced the Latin alphabet due to which the richness of the Aztec language increased considerably. Words of the Aztec language bore influence from the other languages of the region. After the Spanish conquest, it was also heavily influenced by the Spanish language but on the other hand, various words from the Aztec language also made their way into Spanish. While the written script of the language was not fully developed, it had words for almost everything. For instance, Nahuatl words for one to five were ce, ome, yeyi, nahui, and macuil. The words for man and woman were tlacatl and cihuatl. The words for sun and moon were tonaltzintli and metztli. Words also existed for animals, body parts, colours, and every other thing that was used in the Aztec Empire. One of the interesting exceptions in Aztec language was that they did not have any word for “art” even though they had rich artistic traditions. Instead, the works of art were called “toltecat” which referred to a group of people known as “Toltecs” whom the Aztecs considered their forefathers. Pre-Columbian Aztec society did not have a fully developed writing system due to the lack of an alphabet. This, however, was not true for all the Mesoamerican cultures since the Maya script was fully developed before the Aztecs. The elaborate codices of the Aztecs were mainly pictographs which were used for memorising texts dealing with astronomical and religious information, genealogies, and tribal lists. There were three main parts of this “written” Aztec language. These were the mnemonics which did not represent particular words, logograms representing entire words instead of syllables, and another kind of logograms used to signify the sound values of the words. Some scholars have argued that by the time of the Spanish invasion, the Tetzoco school of Nahua scribes had actually developed a written script representing the spoken language phonetically. 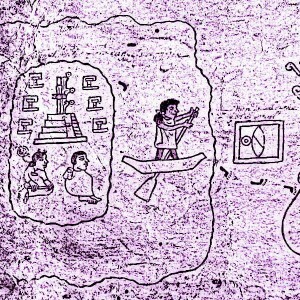 In the absence of the written script, the pictographs and logograms were used in Aztec education. The educational texts containing these pictographs and logograms were mainly used to educate the children in such disciplines as religion, history, astrology, poetry, and others. One of the most important aspects of Aztec education, the basic military training which was necessary for all the male students, hardly required the use of Aztec language. This was because the military training dealt with the practical aspects of warfare and did not have much to do with language. This once again changed with the advent of the Spaniards and use of written language became increasingly common in education. Aztec literature too, before the Spanish invasion, existed in the form of pictograms. Books containing these pictograms could be folded like a fan and were called codices. The paper was made of agarve plant fibre and mainly dealt with religion, sacred rituals, warfare, history, and poetry, among other things. One of the most important works of Aztec literature is the Florentine Codex which makes use of both Nahual language as well as Spanish. This codex covers the history and culture of the Aztecs and Nahuatl people starting from around 1168 till 1591. Another famous book, written by the Aztec priests around the time of the Spanish conquest, is called the Codex Barbonicus. Originally it consisted almost exclusively of pictograms but with the advent of the Latin alphabet, Spanish descriptions were also added. It is a documentation of the Mesoamerican 52-year cycle and consists of a separate section on rituals and ceremonies. Other famous Aztec codices include the Boturini Codex, Codex Mendoza, Codex Tlatelolco, and Codex Osuna etc. Before the Spanish invasion of the Aztec Empire, the Aztec language consisted almost exclusively of pictograms and logograms. They did not have alphabets and hence there was no written script. Due to the lack of the written script, abundant use of pictograms was made and codices containing these pictograms were written about every important sphere of information such as religion, history, poetry, astrology, and warfare. With the advent of the Spaniards, Latin alphabet was introduced in the Aztec language which considerably increased the scope of the language. With the new development, rich literature and poetry was produced in the Aztec language and their history was also documented.